With so many multiplayer shooters available these days, developers have to work hard to make them stand out. 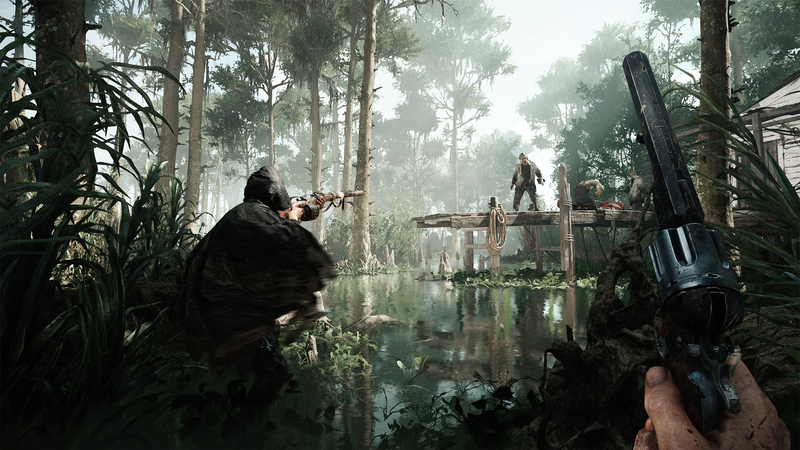 Crytek’s latest project, Hunt: Showdown, looks to do just that. Set in the late Victorian-era, Hunt is a competitive monster hunting first-person shooter where up to five teams of two work to see who can track and kill the target first. Think Evolve, but slower-paced and with more AI-controlled foes wandering around. We were shown a condensed video of a match, showcasing the many phases of the game. The level we were shown was set in a forest swamp at night. AI-controlled enemies roamed the area, the team our video followed deciding to lay low and sneak past them. The reason was two-fold: to conserve ammo and avoid drawing attention. While ammo can be replenished at supply carts scattered around the map, avoiding combat is important since sound travels far. Each match is a long affair, so you need to pace yourself accordingly if you want to survive. On that point, communication seems key. The two players on the team our presentation followed were constantly keeping each other updated on their every move, on every noise, and every movement they caught. Seems like the kind of game where having a friend to play with will be crucial. When they did decide to engage in combat, it was to access a “hell portal” that would grant them a clue as to the whereabouts of the monster. The portal resided in a small cabin, packed to the brim with foes. They make quick work of them, using a couple Molotovs to set them aflame before taking out any stragglers with few gunshots. Stepping into the portal causes the perspective to shift to that of the monster. It’s revealed to be a giant spider (because of course it is), the team deducing that it must be hidden in the farm. The location it resides changes between matches, we’re told, to ensure it doesn’t end up spawning in the same location twice. Our presenter takes a moment to explain the next phase of the match before resuming the video. Once a team discovers the location of their target, things start to pop off fast. Monsters are often extremely well-guarded, meaning you have to fight a ton of foes before you even get to take on the target, potentially using most of your supplies in the process. Then, if you mange to kill the monster, you have to send it back to where it came from, which alerts every other team to your location in an attempt to stop you from securing victory. Hunt devolves into chaos in this phase. Enemy teams and AI-controlled mobs descend immediately. Explosions and gunfire fill the air, fires breaking out all over. Where the majority of the game is about moving slowly and cautiously, here becomes a straight up action game. It’s a thrilling scene to watch unfold. The team we followed eventually comes out of the skirmish victorious, leaving them with one final objective: escaping the area. With all the other teams seemingly dead (might have been one or two still alive; hard to say), they were able to make their way to the exit with ease, thus bringing the presentation to a close. Hunt: Showdown doesn’t currently have a release date. Crytek promises, however, that they will run a beta prior to release. Next Entry EVO, the biggest fighting game tournament in the world, begins today!